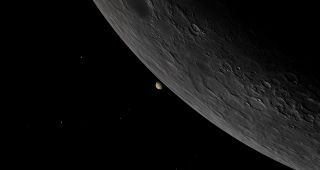 On Monday (Dec. 7), the planet Venus will do a vanishing act behind the moon, but you'll have to be in the right place on Earth to see it without the sun's interference. In the course of its monthly journey around Earth, the moon often passes in front of stars, and occasionally planets. On Monday, the moon will pass in front of the brightest of them all, the planet Venus, in what is called a lunar occultation. Venus is also visible in daylight provided you know exactly where to look. On Monday, its closeness to the moon will help you spot it. The time the occultation will occur depends on your exact location. For example, in New York City, Venus will disappear behind the moon at 12:43 p.m. EST and reappear at 1:51 p.m. In Chicago the occultation lasts from 11:20 a.m. CST until 12:35 p.m. In Los Angeles, the times are 8:06 and 9:56 a.m. PST. The easiest way to get the exact times for your location is with a planetarium program like Starry Night or SkySafari. It was observations of occultations by the moon of stars and planets that first told us that the moon has no significant atmosphere. Stars simply wink out and in as they pass behind the moon; planets show no fuzziness as they disappear behind the moon's edge. Starry Night gives you the opportunity to travel to other places in the universe, and view events from a different perspective. Seen from Venus, the moon will transit Earth, blocking the view of most of North America. If the moon looks strange here, it’s because we’re looking at its far side, the side never seen from Earth. The second image in this guide shows the view of this occultation from the planet Venus at 12:35 p.m. EST (1735 GMT). Instead of an occultation, we see what is called a transit, as one object (the moon) passes in front of another (Earth). The moon is moving from right to left in this view. The occultation is already over on the U.S. East Coast, to the right of the moon, and has yet to begin on the West Coast, to its left. The surface of the moon looks strange because we are seeing its "far side," the side permanently turned away from Earth. This side has more mountains and craters and fewer open flat plains than the side we usually see. This article was provided to by Simulation Curriculum, the leader in space science curriculum solutions and the makers of Starry Night and SkySafari. Follow Starry Night on Twitter @StarryNightEdu. Follow us @Spacedotcom, Facebook and Google+. Original article on Space.com.